One of the biggest questions facing every nation is how to maintain healthcare systems using stretched resources while caring for an increasingly ageing population. For many countries, simply maintaining the status quo in quality of care is a massive achievement. But to improve the quality of care it’s crucial that leaders know how they link improvement to the financial pressures, so improvement becomes the best way to reduce costs. Recently I was delighted to be invited by Healthcare Improvement Scotland to work with some of the most senior leaders across all the NHS boards in Scotland as part of a masterclass on leading for improvement. Although it’s true that in any large system things go wrong, the healthcare leaders in this country have achieved some stunning successes in improving patient safety, particularly around surgical survival rates, post-operative complication rates, reduction of acquired infections and pressure ulcers. These are carefully measured improvements that could stand up as benchmarks for success for any country. When things do go wrong, we need a quality control system, such as inspections. It’s like fixing a flat tyre on a car. You can’t progress without it being fixed. But it’s important that that is not all that’s happening. You need to create an environment in which continual improvement is everyone’s job and each year people can count on living longer and having few complications in their healthcare. That pairing of the quality control function with the improvement function is what’s so unique in Scotland. The Scottish Patient Safety Programme (SPSP) is just one example of the real joined-up thinking that is leading the way to constant improvement. From an initial focus on acute hospitals, their work now includes safety improvement programmes for acute adult, healthcare associated Infections, maternity and children, medicines, mental health and primary care. The reality is that Scotland is the internationally leading success story of healthcare safety improvement. Other nations have made progress, but not to the degree of comprehensiveness – and, I think, scientific discipline – that Scotland has. The innovations and lessons learned across healthcare improvement are now being applied to social care. Taking these competencies and moving them to the larger picture of health and social care integration is a bold move and one that is unmatched globally. Part of this new approach is putting the patient’s voice at the centre of care. There’s a global trend now for a real empowered patient voice. Many countries are on that journey – but again Scotland is ahead of the curve and leading the way in a much more invitational system for people to speak up about their care to make the system better. It’s clear to me that Scotland, compared to other nations, should be extremely proud of what it has done with the improvement of healthcare, and extremely excited about what it can do if it sticks with the ambition to make this country the healthiest one in the world. Improvement is a continual journey and new challenges will always arise. But Scotland’s track record and history of leadership commitment gives me confidence that it is and will remain a model for others to look to. Professor Don Berwick is President Emeritus and Senior Fellow, Institute for Healthcare Improvement. It is most welcome to hear from Philippa Whitford about positive outcomes of NHS Scotland’s collaborative approach to quality improvement and the learning that this might provide for the rest of the UK. I share Philippa Whitford’s concerns about the potential consequences of competitive systems such as occurs more in NHS England with providers, commissioners and contracts and the inevitable fragmentation that this brings. The integrated approach taken in Scotland along with the engagement of patients and frontline practitioners is indeed something to be most positive about. However, NHS Scotland’s approach to Quality Improvement is based on what is known as “improvement science”. This is a relatively new approach to science introduced from the USA and based on methodologies from the engineering and airline industries. The Health Foundation, in its ‘Evidence Scan’ found a “real paucity of evidence about the field of improvement science” . The Health Foundation found papers on the conceptual nature of Improvement Science but concluded that: “none of these could be said to be seminal pieces of research acting as building blocks for the field as a whole”. Scotland has two key National Improvement initiatives for older people in acute hospital care. One is for Delirium and the other is for Frailty. The QI initiative on Delirium was reliant upon “screening tools” that were effectively made mandatory for all those aged 65 years and over admitted to hospital. 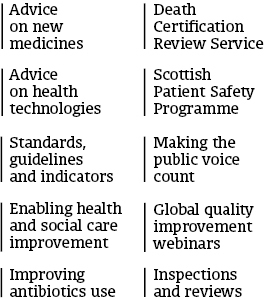 Healthcare Improvement Scotland measured the “compliance” with the use of these “screening tools” across Scotland. On the wards I was finding that these tools were not infrequently being interpreted as diagnostic and that older people were sometimes considered as lacking in “capacity” on this basis. I was also concerned that this approach could lead to greater use of antipsychotic medication. The QI initiative on Frailty is currently being implemented across NHS Scotland. This is despite the fact that there is no internationally accepted clinical definition for Frailty. More “screening tools” have been developed by Healthcare Improvement Scotland and “Frailty Hubs” are now being set up in most NHS Boards. It may be worth noting recent high-level disagreement amongst British Geriatricians about the validity of the “Frailty Industry” as one senior Geriatrician described it. The experience of these national initiatives perhaps highlights the limitations of approaches which work best in mechanical settings. The same success cannot be guaranteed when applied to more complex presentations such as delirium and frailty. It has recently been stated that “ethical approval is less burdensome” for QI. However I suggest that we must be wary of taking shortcuts that may result in potential harm as well as potential good. This is why ethics and philosophy have an established role in science. Another risk is that if science is pre-determined as “improvement”, this may limit the acceptance of critical thinking. Philippa Whitford concludes that in NHS Scotland “Quality improvement has made its way into the DNA of frontline staff”. I share the view that Quality Improvement has much to offer. However, if NHS Scotland has been genetically-modified with QI let us hope that the wider considerations necessary for science are included in the base-code. Thanks again for taking the time to read our blog and for your comments. We’ll make Professor Berwick aware of your response. Supporting better quality health and social care for everyone in Scotland. This blog will provide updates and information on our work, highlight some of the improvements underway across health and social care in Scotland and hopefully prompt some healthy debate.